New grip and pump-lever configuration, same great pistol! A classic redesigned. 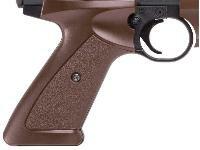 But it's still the same great air pistol America has revered since it was introduced in 1998. 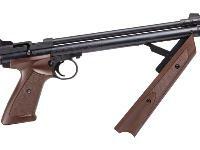 With the variability of using from 3 to 10 pumps, the Crosman P1377 American Classic air pistol is perfect for the family that shoots together. Every shooter can use this gun at his own level. 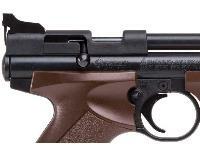 This pistol comes with a blade front sight and a fully adjustable rear. 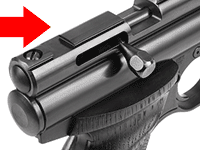 The unusual rear sight can be changed from a peep to a notch sight simply by loosening a screw. You can mount a optics if you buy the optional 459MT intermount. You can also have 3/8-inch dovetails on your pistol by upgrading to the steel breech. Although that upgrade removes your rear sight, there's a kit version that includes a 2-dot rear sight that fits on the dovetails. 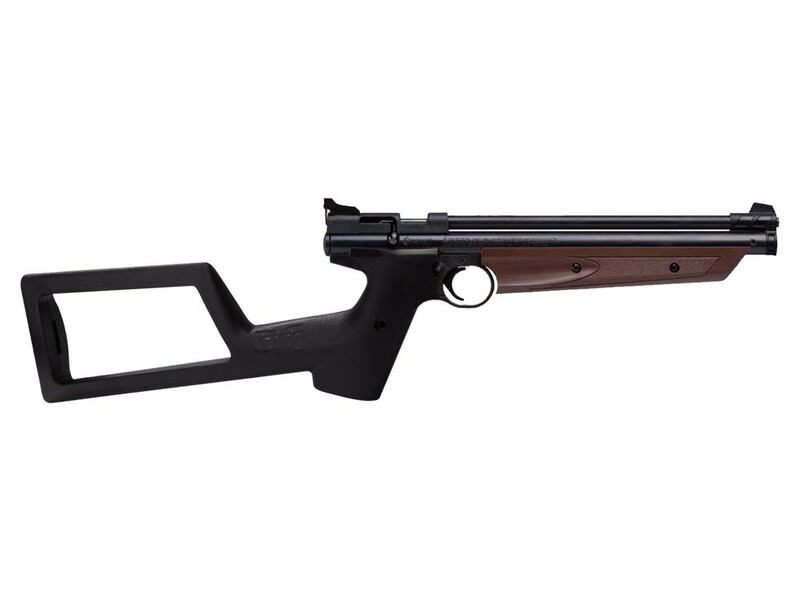 Your 1377 American Classic pistol is suitable for plinking, popping paper targets, hitting spinners and killing tin cans. Things I liked: The look and style. Durable and easy to take care of with a rag and Pellgun oil. Upgrade options. 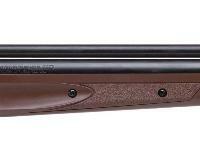 I love the medalist 1322 & the new P1322 and didn't plan on buying the .177cal. version but a near half price sale at a store mmade me consider it, and I have no regrets! Things I would have changed: Charge more for the metal breach version. 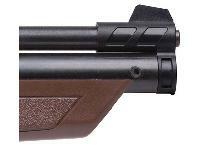 The more I use my 1377, the more I wonder why I didn't try out the .177cal version much sooner! My two 1322's are too loud to shoot inside my apartment, but not this 1377! It has been a blast shooting at 10m pistol targets in my bedroom. It is still fun even from 15 feet :) All in all I think that the 1322 is the best all round air gun, but the 1377 is a close runner up! Things I liked: Easy pump action. Easy to load. Variable power. Feels solid. Things I would have changed: Get rid of the plastic breach, grips and fore stock. Better sights with easier adjustments and a front blade that has some contrast against the rear notch. I'm old and my eyesight is not what it once was. Better trigger would be nice as well. It's a bit stiff at the moment but I have only fired it about 20 times so far. What others should know: Good bargain for the money. I need to play with it more to see if it's just me or the pistol. Accuracy is not where I would like it but I think it's me. It was way better from a rest than free hand. This pistol can be modified into just about anything you want it to be. Tons of aftermarket goodies and modifications. I recently got bit by the airgun bug and now I have purchased 3 rifles and this pistol in the last couple of months. Having a hard time finding the time to shoot as much as I would like. Have a Umarex Octane in .22, a Gamo accu177, and a Daisy 880 that started my second childhood thing I have now. 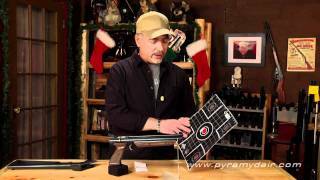 It's amazing what the adult airgun industry has to offer these days. Way more to choose from than I had 45 years ago. It's been a blast playing with these in the back yard and I may be in trouble with my new addiction. Currently eyeballing a Diana 52. I love the under lever Accu and feel my coleection would not be complete without a side lever and at least one nice piece of wood. If you order the steel breech upgrade does it come installed if not how do I install it? Can be installed check out the services box at the bottom of the page . Yes can be used as a pistol. 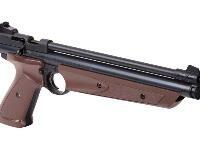 Combine this fine airgun (American classic) with the very deadly Destroyer EX, and you have a nice 10 yard squirrel killer (use all 10 pumps per shot), it's that ok or is it not intended for hunting squirrels? Hey if can get that close go for it i say!